18ct White Gold Channel Set Princess Cut Diamond Wedding Ring — Form Bespoke Jewellers Ltd.
A lovely white gold wedding ring, channel set with princess cut diamonds. 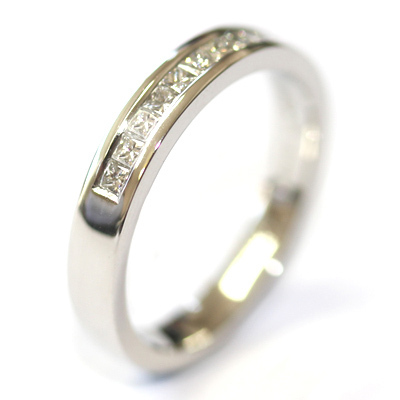 This bespoke wedding ring is part of a complementing wedding ring set. Cast in 18ct white gold, the ring is also set with petite princess cut diamonds. The diamonds are of matching colour and clarity and have been channel set by hand for a flawless finish. The ring was hand finished and polished in our Chapel Allerton workshop and the customer was thrilled with the finished piece (and set). Handmade by Form Bespoke Jewellers in Chapel Allerton, Leeds, West Yorkshire. Please Contact Us for further information on this ring or to see what we can make for you.